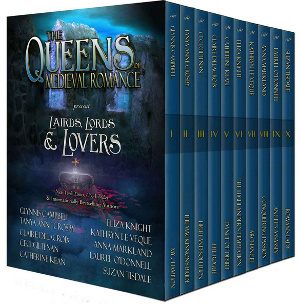 For this week’s Medieval Romance Monday we are featuring Lairds, Lords & Lovers: 10 Full-Length Novels From the Queens of Medieval Romance. This great medieval romance collection contains ten full-length novels from ten queens of historical romance! This is a powerhouse medieval collection from reader favorites Glynnis Campbell, Tanya Anne Crosby, Ceci Giltenan, Claire Delacroix, Catherine Kean, Eliza Knight, Kathryn Le Veque, Anna Markland, Laurel O’Donnell & Suzan Tisdale. When Duncan de Ware finds plucky maiden-in-distress Linet de Montfort challenging pirates, he goes undercover to rescue her, despite her insistence she can take care of herself. Linet, caught in a high seas adventure, soon realizes her only hope is trusting her mysterious champion—with her life and her heart. Scottish chieftain Iain MacKinnon refuses to bow to the English. When his young son is stolen by the English, he captures the daughter of his enemy, planning to bargain with the devil. But even as Page blames her captor for welching on a contract with her father, she suspects the truth… the shadows hold secrets. Now only the love of her reluctant champion can save the MacKinnon’s Bride. Merlyn stole Ysabella’s heart with his charm and his mystery and they wed in haste. Ysabella left her rogue of a husband when she discovered that he deceived her. Five years later, he returns, as alluring as ever, asking for her help. Does she dare to trust him anew? Niall MacIan, needs Lady Katherine’s dowry but he has no intention of giving her his heart in the bargain. He believes all women are self-centered and deceitful. Can the lovely and gentle Katherine mend his heart and build a life with him or will the treachery of others destroy them? Desperate to save her brother’s life, veiled Lady Rexana Villeaux dances for Fane Linford, High Sheriff of Warringham. She entices Fane with the passion in her soul–and he’s tempted. Rexana reluctantly marries Fane, but as she learns more about her husband tormented by secrets, she cannot deny his love. Laird Jamie Montgomery is a warrior sent to the Highlands on the orders of William Wallace. Temptation in the form of an alluring lass, could be his undoing. Lady Lorna Sutherland can’t resist Jamie’s charms. Though she’s been forbidden, she breaks every rule for the pleasure of his intoxicating embrace. Sir Gart Forbes, premier knight for the de Lohr dynasty, falls in love with a woman he can never have. Or can he? Divine intervention comes in many forms in this deeply passionate love story. The year is 1066. The world is about to change forever. Can love survive and flourish amid the carnage, hatred, betrayals and dangers of the Norman Conquest? Juicy historical fiction. An intimate story of passion,ambition, conspiracy, and vengeance. Damien is an assassin, a man with a tortured past. Sold into slavery, he is trained to kill. Lady Aurora of Acquitaine is the epitome of purity and goodness. When Damien enters Aurora’s life, tempting her with promises of forbidden lust, he threatens to tear her peaceful world apart. The bigger they are, the harder they fall. The giant Highlander is a self-proclaimed bachelor who has sworn for years that there isn’t a woman in all of Scotland worth shaving his beard for … then he met her. 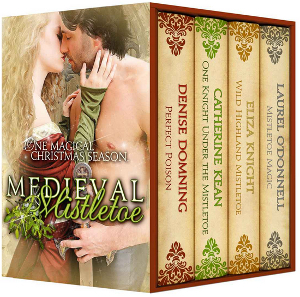 Do not miss this fantastic boxed set of medieval romance novels! For this week’s Medieval Romance Monday we are featuring the brand new medieval romance novella collection Medieval Mistletoe. You can buy it on Amazon for only $0.99 cents! This new collection contains four new Christmas novellas from best selling Medieval authors Eliza Knight, Laurel O’Donnell, Catherine Kean and Denise Domning.